The path up to the lake on 11th April was, in contrast to my last visit, almost clear of snow. 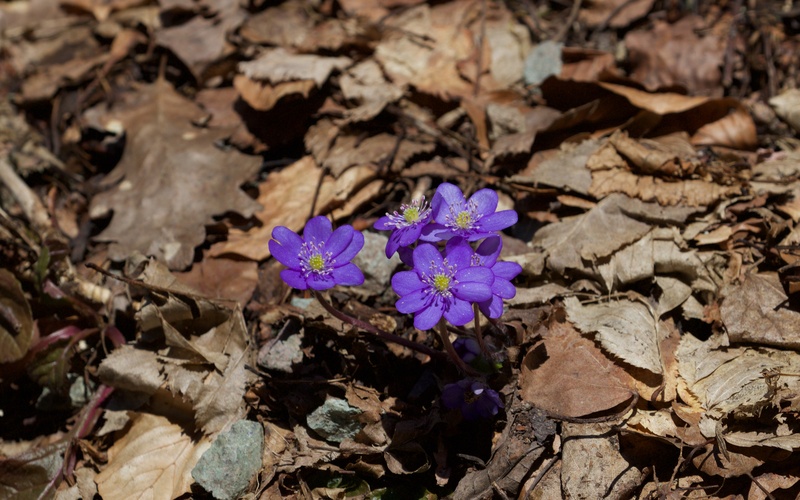 Plants were up in the leaf litter under the high forest. 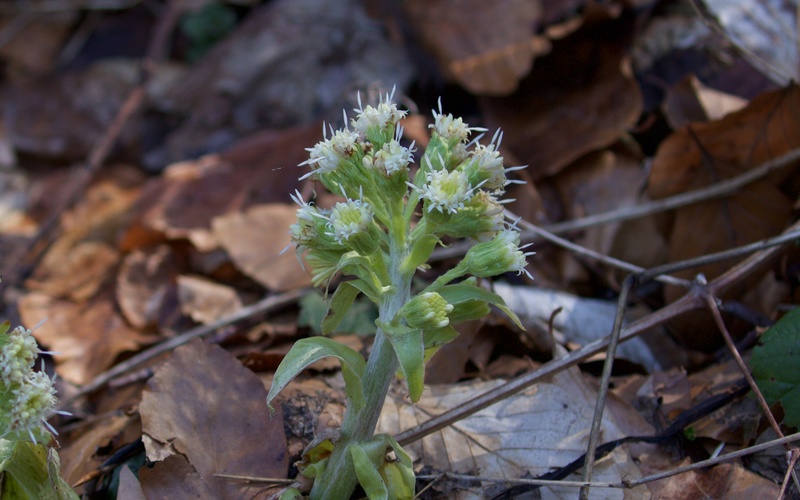 White butterbur (Petasites albus) was most numerous but the vivid blue hepatica (Hepatica nobilis) was more eye-catching. 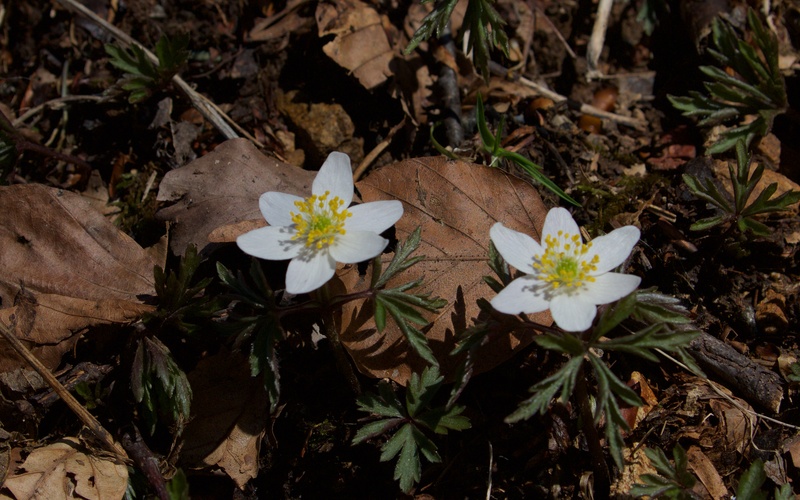 Wood anemone (Anemone nemerosa) and a borage species were also present; over a dozen toothwort (Lathraea squamaria), a broomrape species, were parasitising one roadside beech. 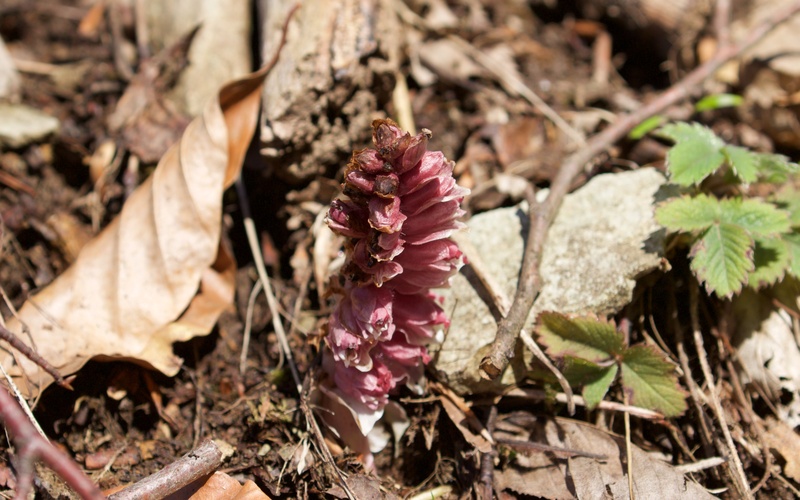 Spring flowers: white butterbur, hepatica, wood anemone and toothwort. At the lake, we navigated the circular path. 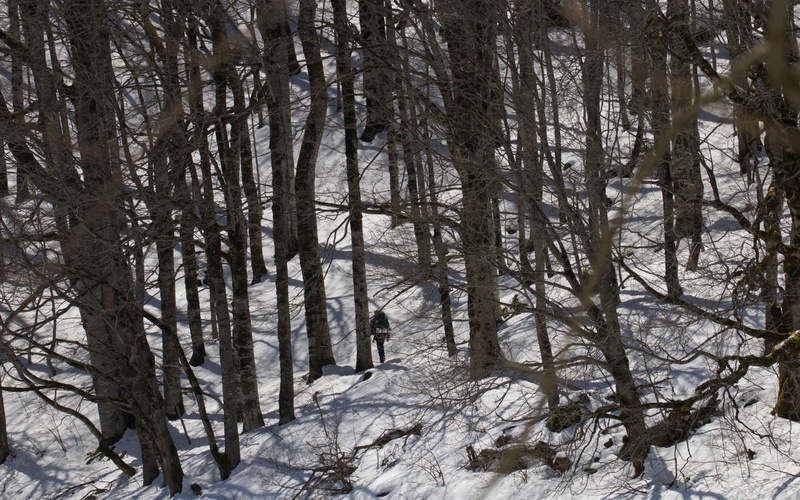 On the sunny south facing side, the path was fairly easy with only a few inches of trodden snow. The ice had relinquished hold of the lake edges and one small corner which held four mallard ducks. It was trickier at the far end where a snow-laden boardwalk carried us over the many streams that feed the lake from the east. 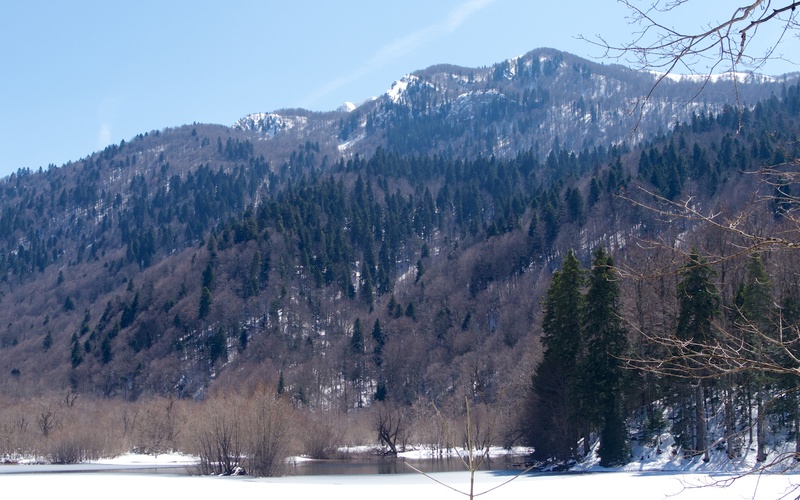 The going was toughest with a foot or so of snow on the colder north facing side, but there was a wonderful view of the sunlit forests rising up the mountainside. A buzzard circled the lake finding a thermal and looked almost white in the brilliant blue sky. The north side of the lake with a lone walker, and the melting lake. 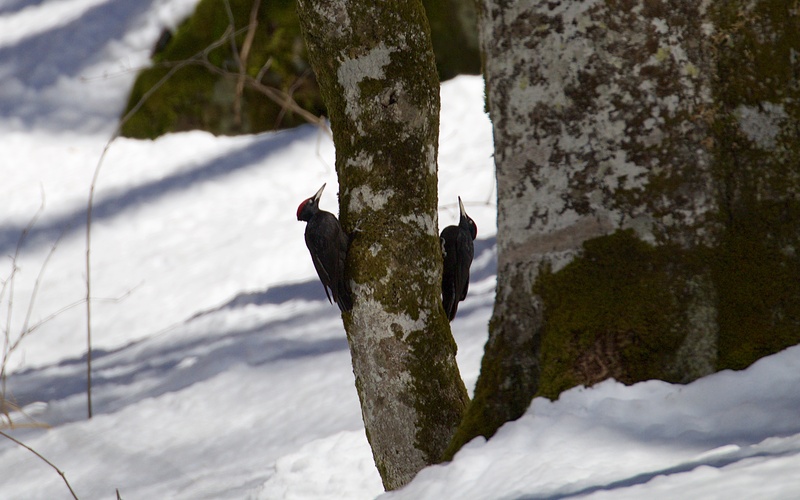 On the south side, a pair of black woodpeckers were courting at the base of a tree; the male chasing the female from tree to tree and then both sitting upright for long periods on either side of the trunk in a silent game of ‘peek a boo’. The female would fly to another tree and the male follow, land and then raise his wings like a black cape but the female was unimpressed and would just sit there or fly to another tree with him in pursuit. 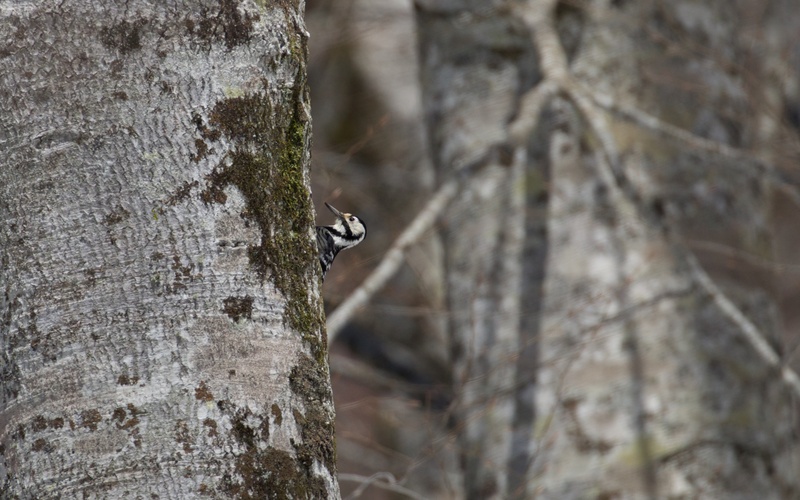 At the same time, a white-backed woodpecker hammered at a tree higher up the trunk and chips flew. We did not see nutcrackers but nuthatches were as noisy as ever. 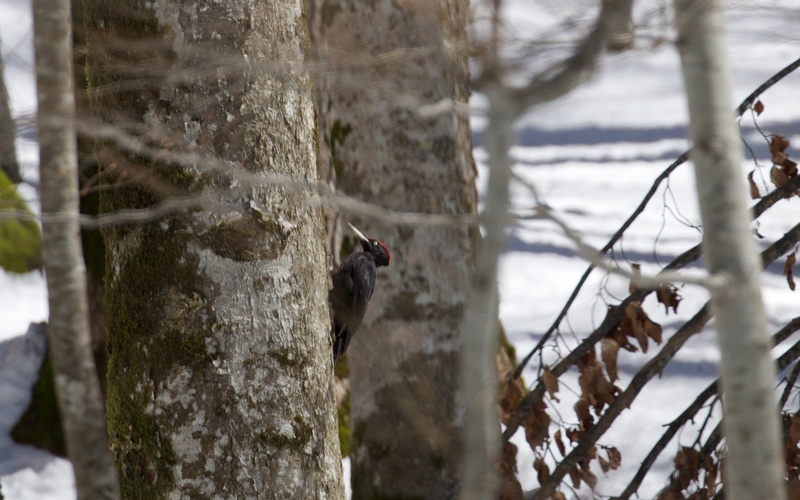 A pair of Black woodpeckers and the female alone; a white-backed woodpecker and bracket fungi on a tree stump. The forest of huge beech, ash and elm shows no sign of bursting into life; it is a slow spring here. A lone brimstone butterfly meandered the snow covered forest in vain. 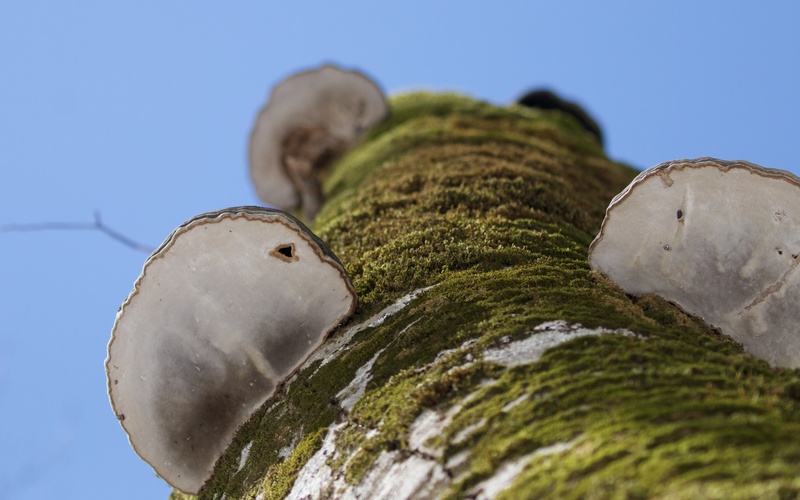 Bracket fungi were on every dead and dying stump.